St. Catherine's Montessori proudly uses environmentally friendly products anywhere that we can. From cleaning supplies to low-VOC paints, St. Catherine's works hard to be good stewards of the earth and to provide a safe non-toxic environment for our students. Around the school and in the classroom: 7th generation hand soap, dish soap and laundry detergent Tissue - recycled content Paper towels - recycled content Toilet Tissue - recycled content Napkins - recycled content Biodegradable cups, plates and cutlery Cleanser Natural bactericide Natural insecticides Zero-VOC paint Fluorescent Lighting The school's use of disposable products such as cups, plates and cutlery is kept at a minimum. Cloth napkins, ceramic cups, ceramic plates, glasses and silverware are primarily used, especially in the classrooms. 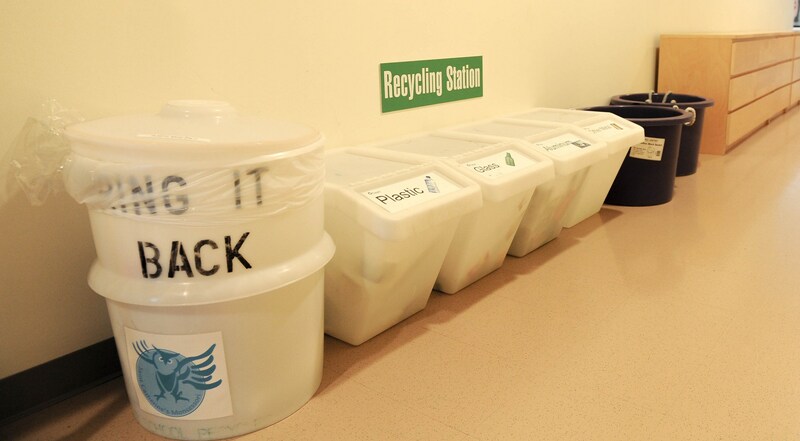 The St. Catherine's Community strives to make environmentally responsible decisions at every turn. Students help reduce waste, recycle materials, and even tote kitchen scraps to various compost bins throughout the school grounds. The compost then nurtures 16 classroom gardens and the vast Adolescent Community Garden, which grows 55 varieties of fruits and vegetables annually. On a larger scale, the school is committed to maintaining and developing the campus in a sustainable way. The school's building was the first LEED (Leadership in Energy and Environmental Design) Certified K-12 school in Texas. Future development projects are always planned with the environment in mind. St. Catherine's students will play an important role in shaping our world. By educating environmentally-responsible people, we are investing in a sustainable future.